While diplomats and high-level representatives from both Belize and Guatemala try to forge some sort of acceptable accord between countries, there are other initiatives to do the same on other levels. Just over a week ago at least sixty pastors from Belize and Guatemala met in the Adjacency Zone between Benque Viejo and Melchor de Mencos to pray for peace. 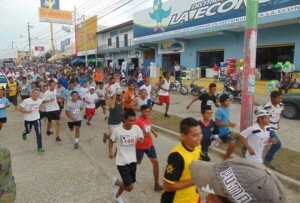 And this past weekend, it was a run for peace, organized we are told by the military component in Melchor. According to a post on the Noticias de Peten Facebook page, the ten kilometer race featured participation from two hundred athletes from both countries. A quote attributed to run organizer Colonel Erick Montiel, “incidents in the Adjacency Zone should not affect the relationship between neighbors, many of whom are related through family.” Benque Police conformed to us late this evening that they were invited to participate in the run, but declined. We are informed that Benque Mayor Heraldo Rancheran did participate. Finally someone had courage (bals)! NEVER THE LESS WE ARE STILL BOYCOTTING MELCHOR AND OTHER GUATEMALAN CITIES COMPLETELY UNTIL THE CLOWN COMES TO MIND AND TELLS US THAT WE CAN TRAVEL TO SARSTOON FREELY INCLUDING THE ISLAND WITH OUT ANY AGGRESSION AND TO MODIFY THEIR MAPS THAT SAYS SO. IF NOT WE KEEP STANDING TALL. NO MATTERS WHO RUNS, HAVE CHURCH SERVICE BY THE BORDER BUT NO GUATEMALAN VISITS TO BE DONE BY REAL BELIZEANS. Merchants and Taxi drivers are now feeling the effects of the craziness their president is doing. There will be more activities they will try to do to restore the relationship again; wait and see. But Belizeans are doing their part as a form of protest. You behave as a good neighbor as before or you suffer the consequences. We do not have enough bullets but we have enough people to boycott commerce.